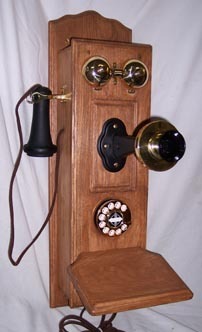 This wood wall phone is a phone made by GTE Telephone in the early 70's, thus the rotary dial. They labeled this Model 1000B, named the "Traditional". They were manufactured from top grade red oak and professionally finished to a satin finish. The stain is a rich brown color. These phones were not available to the general public as far as we know. Only promotional units were released GTE had considered making them for the public, but fire destroyed the wood working plant in the mid 70's. Only 200 available. They are now offered complete and working.